Often used as a subject of wildlife art and wild life artists, the Bald eagle is the symbol of American freedom and power and in a singular sense is one of the most impressive birds that fly’s in the skies of this land. 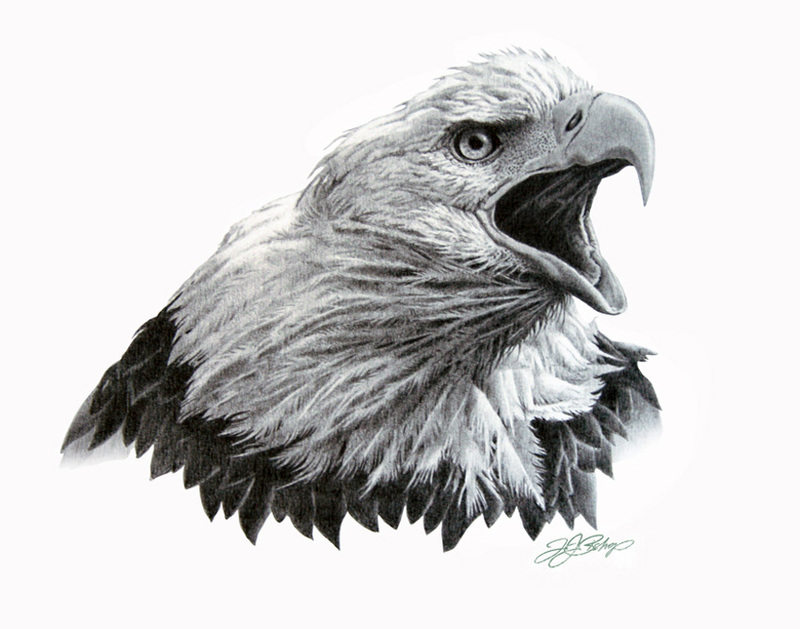 As I’ve illustrated the eagle in this sketch, they are very vocal and will call loudly either to their mates, adversaries or intruders… The bald eagle prefers habitats near seacoasts, rivers, large lakes, and other large bodies of open water with an abundance of fish are optimal for breeding bald eagles. The bald eagle requires old-growth and mature stands of conifers or hardwood trees for perching, roosting, and nesting. Selected trees must have good visibility, an open structure, and proximity to prey, but the height or species of tree is not as important as an abundance of comparatively large trees surrounding the body of water. Being extremely sensitive to human activity it occurs most commonly in areas free of human disturbance. The bald eagle’s natural range covers most of North America, including most of Canada, all of the continental United States, and northern Mexico. It is the only sea eagle native to only North America.